How much does it cost to travel to Yangon? How much money will you need in Yangon? MMK105,077 ($69) is the average daily price for traveling in Yangon. The average price of food for one day is MMK16,300 ($11). The average price of a hotel for a couple is MMK103,394 ($68). Additional pricing is in the table below. These average travel prices have been collected from other travelers to help you plan your own travel budget. Yangon, formerly known as Rangoon, is the largest city and economic center for the nation of Myanmar, formerly known as Burma. The place is a mix of British, Burmese, Chinese, and Indian influences, and is host to beautiful 19th-century colonial architecture as well as modern skyscrapers. The people of Yangon mainly follow the Buddhist religion and it is common to see monks wandering along the busy streets amidst gilded temples. The centerpiece of Yangon is Shwedagon Paya, a huge pagoda complex that stands on the top of Singuttara Hill. It shines with gilded spires and intricate woodwork that attracts tourists as well as pilgrims who frequently visit the sacred site. As far as dress code goes, those who enter the site must cover their legs and remove any footware. The pagoda itself has entrances in the four cardinal directions guarded by statues of Burmese lions with walkways, some of which (like the eastern path) are busy with vendors selling goods to visitors. Other religious sites include the Sule Pagoda, Botataung Pagoda, St. Mary's Cathedral, and a synagogue. The Chaukhtatgyi Buddha, a large reclining Buddha statue, is also popular. Additionally Yangon has plenty of colonial architecture (more on this in the next section). At the heart of Yangon is its bustling downtown and riverfront, where businesses, shopping, and many hotels are centered. This area of the city, at the crossroads of Sule Pagoda Road and Mahabandoola Road, is fairly walkable. The Sule Pagoda, Mahabandoola Garden, an Independence Monument (a large white obelisk in the midst of the garden), are all good landmarks for getting one's bearings in the city. Some of the other popular sights of the downtown include City Hall, the High Court, and the Secretariat. Yangon's riverfront, which runs along Strand Road (known as Kanna Lan in Burmese), is a hub of trading activity and also hosts a number of architectural gems. Some of these colonial buildings include the Yangon Region Court, Custom House, the famous Strand Hotel, and the Myanma Port Authority. The city as a whole is very historic, though there are also centers for shopping as well. Yangon's Chinatown has much to offer in street vendors selling souvenirs, while Bogyoke Aung San Market (or Scott Market) is a great source for Burmese handicrafts. 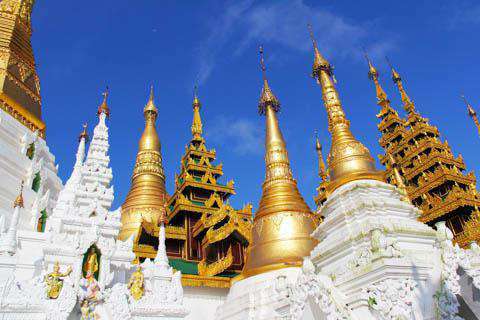 The golden pagodas of Yangon are very popular and can occupy much of the sightseeing in the city. These and the colonial architecture remaining from the 19th century speak to many years of history. One might spend an entire visit exploring these sights and admiring the religious and colonial structures, however, there are some additional activities to add to the variety of the experience as well. Inya Lake, for example, is the largest lake in the city and is particularly known for its gardens. It is a nice escape from the bustle of city life. Other opportunities to get closer to nature can be found at the Zoological Gardens (known for its animals) as well as the Mahabandoola Garden (known for its roses). Formerly known as Burma, Myanmar has cuisine that is of the Burmese tradition. It is characterized by an extensive use of fish products like fish sauce and ngapi (a paste made from fermented seafood) as well as rice, fresh vegetables, tropical fruits, and condiments like pickled mango and fermented beans. Some typical dishes include a ginger salad with sesame seeds called gyin thohk, a wheat noodle salad with dried shrimps, shredded cabbage and carrots, dressed with fried peanut oil, fish sauce, and lime (khauk swè thoke), and a plate called mohinga which consists of rice vermicelli in fish broth with onions, garlic, ginger, lemon grass, and sliced tender core of banana-stem, served with boiled eggs, fried fish cake (nga hpe) and fritters (akyaw). Due to its geographic location, Myanmar's cuisine has been also been largely influenced by Chinese cuisine, Indian cuisine, and Thai cuisine. All three can individually be found in the city of Yangon as well as other international flavors of the western hemisphere. Yangon International Airport (in Mingladon) is located approximately 15 kilometers north of the city center. It offers both domestic and international flights to and from cities including Dubai, Bangkok, Chiang Mai, Dhaka, Hong Kong, Kuala Lumpur, Penang, Singapore, Gaya, Kolkata, Kunming, Guangzhou, Nanning, Hanoi, Ho Chi Minh City, Seoul, Doha, Taipei, and Tokyo. From the airport, are available for transportation towards central Yangon. There is also a bus stop located about 15-20 minutes walking distance from the airport. Visitors can also take a train between Yangon and other parts of Burma. For example, several trains daily connect Yangon to Mandalay via Bago with connections to Bagan and the Inle Lake area at Thazi. If you're planning a trip here as a family, read this great guide of things to do in Yangon with kids.